From November 15 to 16, 2018, Jiao Hong, Head of National Medical Products Administration (NMPA) of China attended the China - CEEC Drug Regulatory Summit and delivered a keynote speech in Czech Republic. Drug regulators from nine countries, including Czech, China, Slovakia, Croatia, Montenegro, Latvia, Lithuania, Hungary and Poland attended the summit. Also present were Roman Prymula, Vice Minister of Health of the Czech Republic and officials of Chinese embassy in Czech. Jiao Hong indicated that Czech, as a key country along the “Belt and Road”, is also an important trade partner of China. As a key part of the Budapest Guidelines for Cooperation between China and CEEC Countries signed by Premier Li Keqiang in 2017, the successful launch of China-CEEC Drug Regulatory Summit marked another progress made in the cooperation between China and CEEC countries. Jiao introduced China’s progress in the reform of review and approval system on drugs and medical instrument, saying China’s drug regulators are ready to work closely with the counterparts of other countries and international organizations through China-CEEC Drug Regulatory Summit as a key cross-regional cooperation mechanism to push forward the industrial communication and interconnection and to protect and promote the public health. 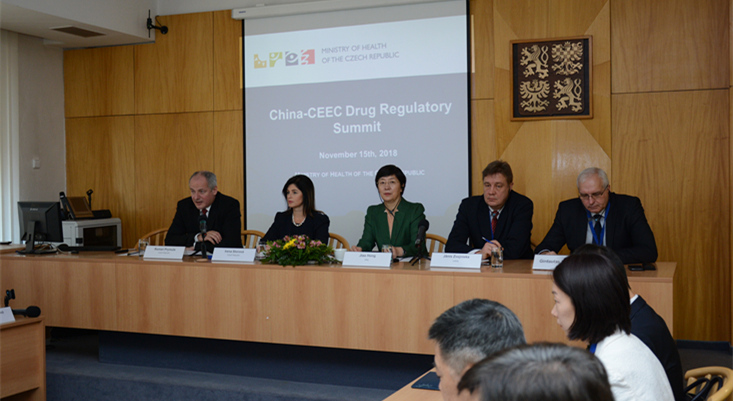 On the sideline of the summit, Jiao also held the session with the industrial representatives to learn about the communication between the domestic drug representatives and their industrial counterparts in Czech, the development layout of China’s drug enterprises around the world, in particular CEEC countries, and their suggestions and proposals. The participating enterprises highly affirmed the relevant policies of NMPA on certification of drug export sales and suggested ways to improve the policies on drug registration and supervision for import and export. Jiao indicated that the comments will be further studied and the reform measures will be improved. While encouraging the entry of good medical products into China, support will also be given to domestic enterprises in going global, thus bringing more and better medical products to people in the world.